This roasted asparagus recipe is super simple, quick and tasty! 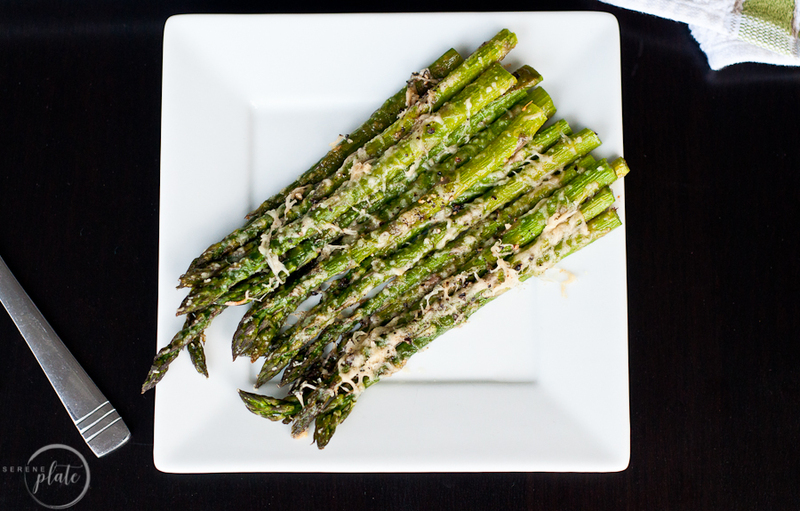 When asparagus is in season and you can add a beautiful bright green side dish to your plate, you’ll be happy you did. I think any vegetable can be elevated when it’s roasted, covered in parmesan cheese and some yummy seasonings! Small side note about me. For the LONGEST time, I have hated vegetables. Yup, you read that right. Hated them. There were only a select few I would eat. Then I had my daughter and I realized she learned to eat by watching me. To be honest, I think this is why she is as picky as she is. I tried to implement good veggie eating habits but it was hard because I just didn’t think about them much. Now my husband on the other hand, LOVES him some veggies!! But in the beginning I did most of the cooking, so he got the few veggies I liked on repeat. After we started cooking together, I learned how to prepare more veggies and it is because of Brandon that I now eat just about all of them and my daughter is starting to as well. Broccoli is her current favorite. She is still not interested in asparagus and I am learning to love it. Finding new ways to cook vegetables has been a huge part of my new culinary journey. How do you cook asparagus so it’s tender? Asparagus can be stringy when cooked sometimes so I like to make sure it is really tender. I trim (or snap) the ends off and throw them away. Then I put the remaining stalk into a large zip lock bag. I add in some avocado oil, seasonings and parmesan cheese. Shake so the asparagus is well coated. Spread them out on a lined baking sheet in a single layer. I sprinkle on even more parm, then I bake them until the tips start to get a little brown. This takes anywhere from 10 to 20 minutes. It depends on how thick your asparagus is and how ‘al dente’ or soft you like it. Snap (or cut) off the dry ends (the woody end parts) of the asparagus and discard. Place in a zip lock bag, add Parmesan cheese, garlic, salt, pepper and any other seasonings you’d like and shake to coat well. 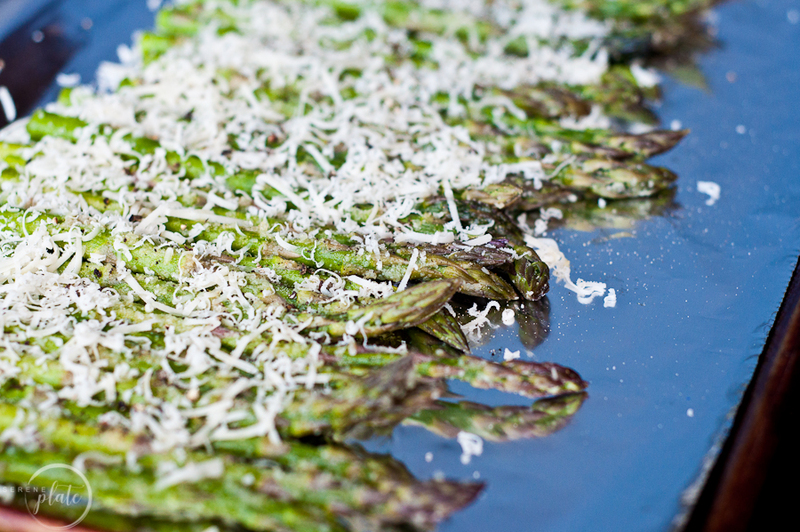 Spread the asparagus in a single layer on a lined baking sheet. Roast for 10 to 20 minutes. If you like your asparagus left with a little crunch, roast closer to 10 minutes. If you like it more soft, go closer to 20 minutes. How do you cook asparagus in water? If you do not want to roast your asparagus, you can also cook it in water. Bring about 1 inch of salted water to a boil in a skillet large enough to fit your asparagus in one flat layer. Cook them until they are tender. This should take about 5 minutes for a medium size asparagus and 7 minutes for a larger stocked asparagus. Once done, drain off the water and transfer the asparagus to a serving platter. Is asparagus bad for you? As far as life-threatening effects go, no, you cannot eat too much asparagus to cause significant harm to yourself, thank goodness. However, some uncomfortable things, such as gas and a strong smell when you urinate can happen. Do you have to peel asparagus? I think taking off the woody part at the end, about an inch or two, of any asparagus is necessary. Peeling the asparagus can depend on it’s thickness. The larger an asparagus gets, the tougher it’s skin is. Peeling the larger ones will help them get tender. It is good practice to peel your asparagus to about ½ inch in diameter. You can also use the peels in a salad. They look really pretty when added. Is asparagus good for losing weight? 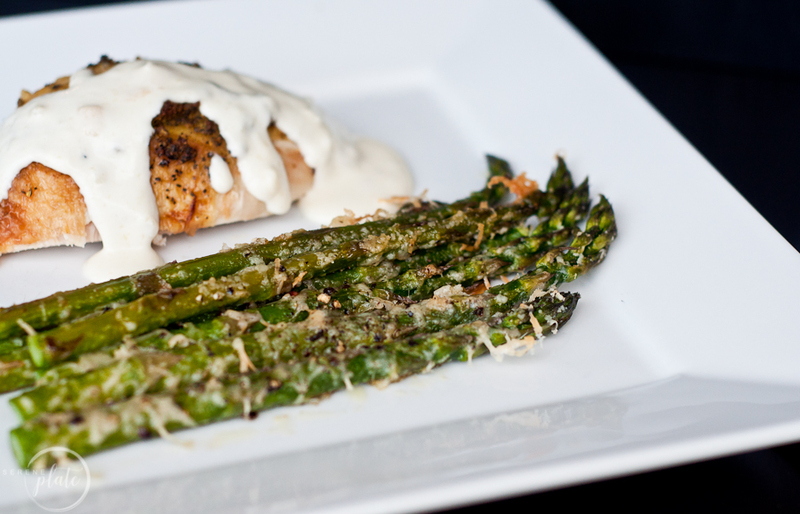 The cool thing about asparagus is it is full of soluble and insoluble fiber! This helps you stay full longer and at a small amount of caloric intake (32 calories to be exact) it is a great side dish option. Can you eat the whole asparagus stalk? Yes, you can, but remember… the bottom of the stalk can be very fiberus and woody which makes it touch and chewy. I am also not a huge fan of eating asparagus raw, but I have seen some recipes where they are chopped very thin and added to salads. This simple roasted asparagus recipe can be paired with many dinners. I like to make it as a side dish with a dinner where I also make the Best Alfredo Sauce, because everything is great smothered in Alfredo, am I right?! 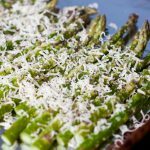 But no matter how you cook it; steamed, grilled, spiraled into a salad or chopped for a risotto, and my personal favorite, oven roasted…there are a ton of ways to enjoy asparagus! This roasted asparagus recipe is super simple, quick and tasty! When asparagus is in season and you can add that beautiful bright green side dish to your plate, you’ll be happy you did. I think any vegetable can be elevated when it’s roasted, covered in parmesan cheese and some yummy seasonings! Wash and cut off the woody ends of your asparagus. Most likely this will be one to two inches off the bottom. Peel the out side of the asparagus if needed. I do this if the stalk is to thick. I like the stalk to be about 1/2 inch in diameter. Place the asparagus in a large zip lock bag. Add the avocado oil, 1/4 cup parmesan cheese and your seasonings. Shake well so the asparagus is well coated. Lay the asparagus out on a lined baking sheet so it is all on one layer. 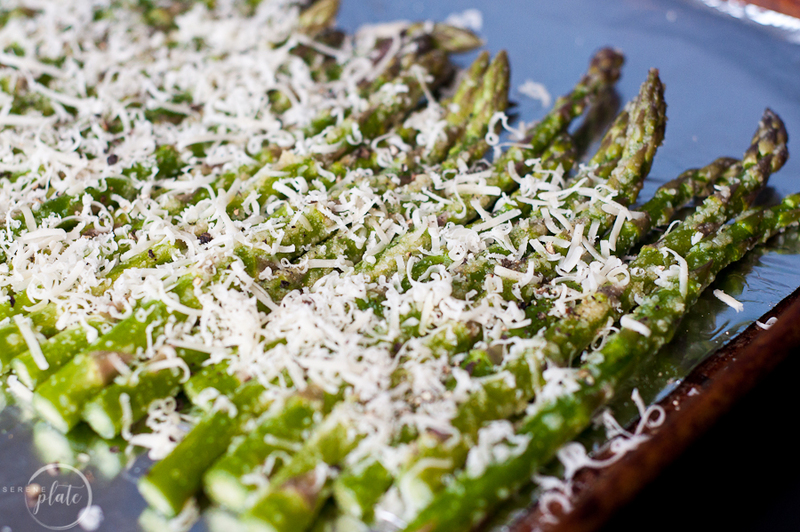 Sprinkle the remaining parmesan cheese on top of the asparagus. Put the asparagus in your oven and roast until the tips start to turn a little brown. 10 to 20 minutes. If you like your asparagus left with a little crunch, roast closer to 10 minutes. If you like it more soft, go closer to 20 minutes.